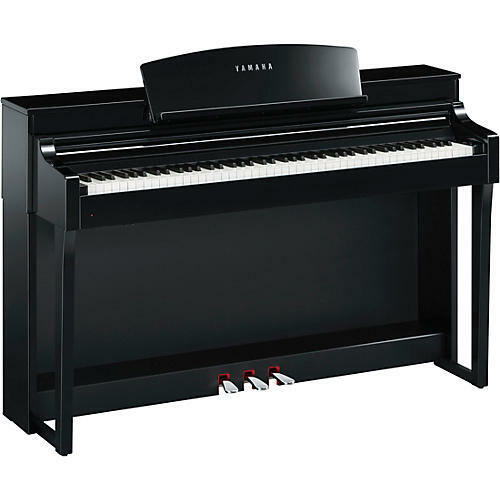 The CSP-150 will teach those who have always wanted to play piano how to play their favorite songs, right out of their own music library. The Smart Pianist app analyzes any song within seconds, and produces a piano score that they can read, all while Stream Lights above each key show them which notes to play and when. The CSP will dispel any preconceptions you might have about playing the piano being a difficult, frustrating experience. The dedicated CSP app analyzes the music you want to play and then creates a piano accompaniment score for you. All you have to do is follow the Stream Lights. CSP Clavinova offer unrivaled capacity for musical expression, with a huge variety of instrument voices that bely their simple, elegant exteriors. You can also enjoy ensemble sessions with rock or jazz bands, and even bossa nova orchestras, simply by assigning Styles. Smart Pianist features an "Audio To Score" function that automatically creates a piano accompaniment score from songs on your smart device, allowing you to enjoy playing along with your favorite tunes. Audio to Score uses songs saved on your smart device. Music accessed via subscription services is not compatible with this feature. Enjoy accompaniment from a dynamic backing band, even when you’re playing by yourself. The accompaniment provides a wide variety of patterns across a range of genres to match your performance. You can also connect a microphone and sing along with harmony functions that allow you to automatically create a chorus backup for your performances, even when you’re singing alone. With two world-renowned concert grand pianos available at the touch of a button, the CSP Series lets you choose the perfect piano tone for the music you want to play. Offering far more than just sampled sounds, the CSP Series reproduces the Yamaha CFX concert grand and the legendary Bӧsendorfer Imperial in meticulous detail. Yamaha’s advanced binaural sampling technology is now available on the Clavinova. The technology uses samples from the CFX, Yamaha’s acclaimed concert grand piano, recorded with specialized microphones that capture locational information and other nuances discerned by the human ear. The resulting sound is so natural, so enveloping, that you’ll soon forget you’re even playing a digital piano.